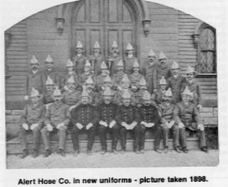 The tradition of unparalleled community service began over a hundred years ago for the Alert Hose Co. No. 1, Adams’ volunteer fire department. The town warrant of 1845 contained an article for the establishment of the Triton Fire Engine Company No. 1 in Adams. A committee comprising William C. Wheeler, H. J. Barker, and Andrew A. Richmond was appointed with instructions to draft a constitution and present it for consideration at a meeting of the company at the Lafayette House on April 23, 1845. The constitution was accepted and on May 5, 1845, the following officers were elected: H. J. Barker, foreman; William Burton, secretary-treasurer; Stephen W. Conklin, 1st lieutenant; and Lucius Carpenter, 2nd lieutenant. This Triton Fire Engine Company No. 1 did splendid work as a volunteer fire-fighting organization during the early history of the town and was a worthy predecessor of the Adams Fire District and the Alert Hose Company. With the establishment of the Adams Fire District in 1873, the need for a accountable fire department soon became evident. At the first district meeting, the following fire officers were chosen: Levi L. Brown, chief engineer; James Osborne, first assistant engineer; James S. Adams, second assistant engineer; A. B. Mole, third assistant engineer; and John J. Marsh, fourth assistant engineer. On May 20, 1876, a meeting took place at the Greylock House whereby 33 young men formed a hose company to serve the town. A. B. Mole was chosen Foreman, John Whipple, first assistant foreman; James Osborne, second assistant foreman; Franklin H. B. Munson, secretary; and Albert Upton, treasurer. 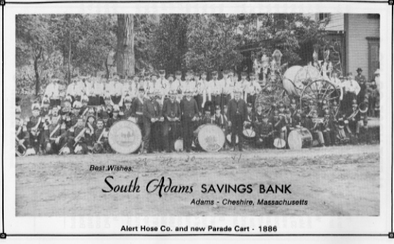 The hose rooms were located in the Collins Block on the site of the present South Adams Savings Bank. 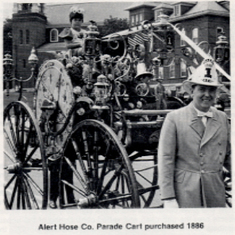 The Prudential Committee provided the company with its first apparatus, three hand drawn hose carts. These carts were housed around the town, one in the Old Stone Mill in the Grove section, one behind the present Baptist church, and one in the Adams Paper Mill where St. Thomas Church now stands. By 1883, the company had expanded to 40 men and another hose cart which was located in Renfrew. The number of men in the company fluctuated during the following years, until 1893, when the number of 40 members and 5 engineers was determined an ideal company and this organizational structure has continued to this day. In 1890, land was purchased on Park Street where the Adams Ambulance Co. is now located. A new building was erected there and in 1891 the company moved into its new facility. At the time, the firehouse was judged to be the most impressive hose house outside the city of Boston. The company maintained its residence there until 1960 when it moved to its present location on Columbia Street. The current Hose House was formerly a service station and underwent extensive renovations to enable it to meet the needs of a modern fire department. Improvements and maintenance continue with the most recent being the installation of new, energy efficient windows throughout the structure. Exactly one month after the organizational meeting, the company responded to its first call, a structure fire on Center Street. The building was owned by Dallas J. Dean. Through the years that followed, the company would respond to its share of tragically spectacular fires. In 1886 the Zylonite Mill fire claimed two lives and on Christmas Eve, the No. 1 mill at Berkshire Fine Spinning burnt. The year 1891 saw losses estimated at between $450,000 and $800,000 at the Renfrew Jacquard mill. The Jones Block burned in 1905. In 1915 the Polish Catholic Church and the Collins Block, former home to the Alerts, fell victim to flames. The Notre Dame Parochial School fire of 1916 was noteworthy for its coincidence in that the company was attending a muster in Pittsfield at the time. Thirty thousand dollars worth of cotton was lost to fire in 1919 at another Berkshire Fine Spinning mill, No. 3. and the Italian Church burned in 1927 ($15,000 loss). 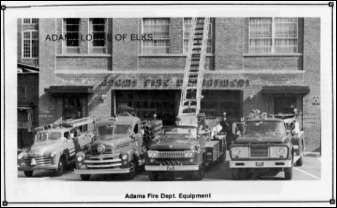 In 1941, an organization known as the Adams Auxiliary Firemen came into existence to assist the Alert Hose Company under the Civil Defense plan during World War II. The auxiliary was comprised of 30 men who were well trained and had their own equipment. Leaders of this group were: Arthur H. Charpentier; general chairman of the organization; James B. Woods, foreman; Herbert Gross, first assistant foreman; John Gimalowski, second assistant foreman; Emil R. Langner, secretary-treasurer; and Edward Johndrow, instructor. After the war, large fire events included, the Adams Laundry in 1946 ($80,000 loss), and the former Town Hall in 1949 ($55,000 loss).. 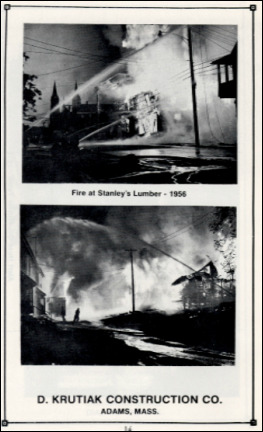 In 1956, fire completely destroyed Stanley's Lumber Yard as well as making 19 families homeless. The year 1968 saw the complete loss of the Adams Super Market on Park Street. The Berkshire Bank building which currently houses the Greylock Credit Union now stands in its place. Park Street, the main avenue through town lost The Crest candy shop in 1982. In 1975 the Arnold Fuel Co. was destroyed in a blaze exceeded only by the mammoth 1984 fire at the vacant Arnold Print Works complex. In fact, 1984 proved to be a busy year for the Alerts. Three other major fires occurred that year. The company responded to the Berkshire Metal Spinning building on a night where temperatures reached 17 degrees below zero! On Christmas day, the Glenview was destroyed by flames. Yet additionally, the company has also responded to countless, less spectacular but equally important calls, meeting each with the same brave effort. Because of this commitment, numerous lives and properties have been saved. The system used to bring the Alerts into action has seen significant change over the years. In 1876, the popular alarm system was to use whistles which were located on structures in the various parts of town. Three whistles were used in Adams. The northern whistle was located on the Gingham Mill, the southern on the Stone Mill, and the central on the Adams Paper Mill. Confusion reigned if all three whistles blew together. Fortunately, an alarm system was installed in 1893. The system had 21 boxes divided between the town's five districts. Each box had its own signal. Adams was the first to use this type of system and other communities soon adapted it. In 1969, the “Group Alerting Telephone System” was installed and operated by the Adams Police Department. This system allowed the company's members to receive the exact location of the fire over the phone. This technology later gave way to the present system of wireless communication via pagers. The company's apparatus was also consistently updated. Key additions included a hook and ladder in 1888, a sleigh for winter use in 1895, a horse drawn hose wagon in 1896, and a combination hook and ladder in 1897. The rig carried the price tag of $1,500.00, no doubt a considerable amount of money in those days! In 1918, the first motor driven fire truck, a Federal Ladder Truck, was delivered to the department. A Seagrave triple combination pumper was added in 1923 and a Seagrave city service hook and ladder truck in 1925. In 1936 the fire district purchased a 500 gpm Mack pumper which would stay in service until 1963. As of 1976, the company's one hundredth anniversary, apparatus included a 1948 Chevrolet auxiliary truck, a 1952 Seagrave 750 gpm pumper, a 1964 Ford 500 gpm pumper, a 1958 Ford 65’ aerial ladder and a new 1976 Maxim 1000 gallon pumper. Interestingly, the Maxim was not the apparatus the district originally wanted. In fact, the district had contracted with Seagrave in 1974 to build a new pumper but by April of 1976, the truck was almost one year past due and a $150,000 lawsuit was pursued against Seagrave and the bonding agent. By 1995, the Seagrave and Ford pumpers had been retired and replaced by a custom built KME top-mount engine. The Ford aerial too was replaced, this time by a custom made Pierce 105’ quint. The old Ford lived on though, providing service for the residents of Lanesborough, Massachusetts. In 2008, the 76 Maxim was replaced with a new custom-cab E-One engine. In 2017, the 1989 Pierce ladder will be replaced with a Ferrara 100' mid-mount tower ladder quint. The colorful history of the Alerts also included the glories of their running teams. The first organized team began competitions in 1884. The group quickly established a amateur team world record with a victory in North Adams. The following year, the team brought home prizes from races in Fort Edward, N.Y., Syracuse, N.Y., Chicopee, MA, Amsterdam, N.Y., Great Barrington, MA, and took the Western Massachusetts championship at a muster in Pittsfield. All told, the teams of 1889-1892 reportedly returned with more than $1,500 in prizes and several silver speaking trumpets which are still carried in parade formation today. Even the Alert uniform has become part of company tradition, although the question created quite a hot issue. Prior to its formation, the company's members hedged from blue to red to white shirts until June 7, 1876 when the company voted that a white shirt with blue trimmings be adopted to complete the uniform of dark pants, a fatigue cap and a black belt white trimmings and the figure “1”. To anyone who has seen the Alerts in a parade or at the Annual Ball this of course bares no resemblance to the unmistakable uniforms the company currently wears. The original uniforms of 1876 were replaced 17 years later in 1893 when the company adopted the turn-of-the-century, Prince Albert style, buff and white uniform that has become a trade-mark of the Alerts. This rare uniform style has been preserved by the company as a memorial to its predecessors and is worn proudly with distinction by the Alerts of today. Dressed in its elegant uniforms, the company has won numerous prizes for its parade appearances through the years and continues to be in high demand for parades across New England. In 1885, a parade cart was built to order in Seneca Falls, N.Y. which added greatly to the appearance of the company at parade time. In 1975, students at McCann Technical High School built a trailer to help preserve the antique cart and transport it to its many destinations. The large trailer featured protective bracing on the inside and beautiful artwork on the exterior. It was dedicated to Claude W. Gould, a company member from 1916-1970. Formed as a protective organization, the Alerts have also developed into a leading social organization without sacrificing one bit of efficiency. Although the clambakes, musters, banquets, field days, innumerable parades, aid during the disastrous floods, and service in the country's wars all form part of the rich heritage of the social and civic consciousness of the company, the Annual Ball best reflects the unbroken and varied contribution of the unpaid members of the Alerts to the community. Started in 1877, the ball, which has, on occasion, attracted nearly 2,000 attendants, began and has continued as a fund raising project for the company's welfare and charity fund. Other annual fund-raising events include the town canvas which the community has generously supported for years, and the Alert Hose Golf Tournament. 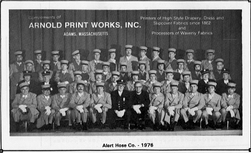 This is the history and tradition of the Alert Hose Co. No. 1, one of the oldest and foremost volunteer fire fighting organizations in the country and unrivaled and unparalleled in community service. Know of something left out or have corrections? Please contact us.